Greetings taco lovers! Contrary to rumors within the taco community I did not get food poisoning from a taco truck and die. This rumor was circulating within the underground taco scene and even I started to believe it. But my immune system is too strong from years of outlaw eating to worry about food poisoning. I’ll probably die one day from getting hit by a runaway taco truck though. So where have I been? I put myself on a self imposed 40 day taco exile. I checked into the gym to train and get in tip top shape for the summer taco season. Eight months of taco hunting and weekend binge drinking had slowed down your humble taco correspondent so I put myself on an extensive training regimen. The summer taco season is quickly approaching and a sluggish Bandini may not have made it through all the carne asada bbq’s, late night taco runs and alchohol binges. Having not had a taco in 40 days I felt like going somewhere farmiliar but on a whim I headed to tacos chapalita in Lincoln heights. I’ve been wanting to try this taco hut ever since a reader once suggested that the king taco across the street is usually empty due to the awesomeness of tacos chapalita. Well, the king taco was pretty busy but so was la chapalita so I didn’t know what to make of the situation. I ordered my tacos and popped open a lime jarritos. Tacos Chapalita is a taco hut that serves tacos,burritos,tortas and other antojitos . There's a meat market by the same name adjacent to the hut and a long counter for taco patrons to sit at and eat their tacos.There are several specials posted on a wooden sign but the one that stands out is the 4 asada tacos and a can of coke for $3.99. 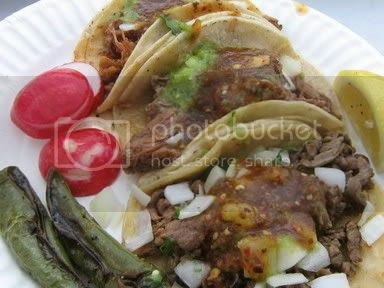 I wanted a little variety so I ordered pastor, asada, and barbacoa. I'm not sure what I was expecting with barbacoa since barbacoa at a taqueria can mean goat or shredded beef. I was so eager to get my tacos that I didn't care to ask which kind it was. 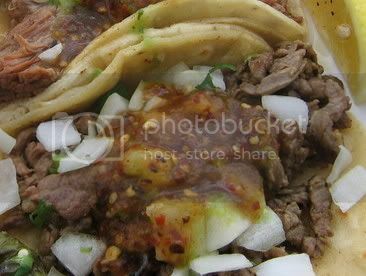 Once I bit into the taco I was really back to a farmiliar place.They were just how I remembered how a taco should be.The two soft corn tortillas piled high with meat and a smoky salsa were heaven on my lips. With a lime jarritos at my side I was back where I wanted to be. The al pastor was spiced with a soft pungent glaze and the asada while not very seasoned had a soft texture to it that went well with the salsa and onions. The barbacoa? shredded beef my friends and I was a bit disapointed by it but it doesn't take away from the satisfaction of the al pastor and asada. Overall it was a good taco experience and after 40 days without a taco I was happy to have made the trip to Tacos Chapalita. As I sat at the counter eating my tacos I thought of the days of summer that lay ahead and the taco journey that still awaited me. I looked out to the streets where the crowds hurried with their shopping bags and nervous smiles and watched automobiles come from all directions like they were late for yesterday. Sometimes the city moves like a train off it's tracks and you sit there with your plate of tacos slowly letting the day come to you. Have been going there since the 80's! I am so happy you're back! I've been checking daily anxiously awaiting your return. The tacos sound delicious -- looking forward to an summer full of great taco recommendations. Bandini!! Welcome back! I missed your taco news and reviews. 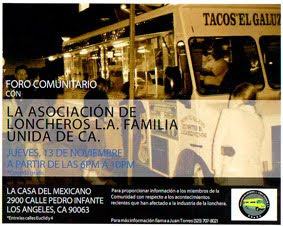 Can't wait to try Tacos Chapalita...sounds divine! So now Bandini is a "lean mean taco eating machine"? Welcome back. Glad you are back, I've been missing the regular updates on the rss feed I use on My Yahoo! homepage. Chapalita is great, I grab tacos and tortas on my way home from work at least several times a month. I'm glad you finally reviewed it. And based on the 3 1/2 stars I am even more eager to check out the few 5 star reviews you have done. Tacos Chapalita are my fave tacos in all of LA! I can't believe there was anyone in King Taco. 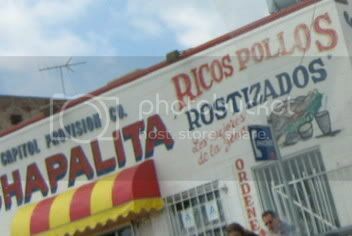 I also suggest getting one of the roasted chickens from the attached store. In the store you can also buy the little tortillas to make your own tacos...and beer...and carne... and mesquite. You have got to try the shrimp tacos!! the shrimp tacos are some of the best of the grilled variety around. watch out though, the salsa and peppers here are no joke in terms of heat. there are no better tacos on earth than the chicken tacos at chapalita! and you know what? the place ALWAYS has an "A" rating from the health dept. great food. if you go at noon, be prepared to wait in line! been eating there since '90. at times in the early 90's my entire office would eat there 5x's a week!